When I see someone trying to make any kind of broader impact with their craft – I always stand up and applaud. When I saw that Blight is a part of a special compilation I asked Nicholas if they would be up for sharing more about the project – to which he blew me away with this piece on what it is and why it matters. Hello! My name Nicholas and I play bass in a band called Blight. If you’re local to the Panhandle area (and involved in our beautiful music scene) then you might have seen us around. If you’ve never heard of us, we’re an instrumental atmospheric metal band. * Shameless show promotion * If you haven’t seen us, we are playing April 1st at Vinyl Music Hall in Pensacola along side of some of our friends and favorite local bands: Accursed Creator, Black Titan, Dicks from Mars, and Rezolve! Now onto things of more importance, The Flint, Michigan Water Crisis. In 2014, state officials in Michigan decided to switch Flint, Michigan’s water supply from Lake Huron to the Flint River. The Flint River is notoriously known in the local area for its poor water condition. The problem with switching the water source is the Department of Environmental Quality was not treating the Flint River water with the proper anti-corrosive agent needed, which is in violation of Federal law. The water was turning brown and full of lead in addition to the iron from the pipes. Fast-forward 2 years later, a doctor in Flint was concerned with the amount of patients stopping in concerned with rashes and sudden hair loss. The young doctor, known as Dr. Mona was concerned with the lead levels in her toddler patient’s blood. Medicare requires the State to keep records of lead levels in children. This topic holds a special place in my heart; Pensacola and Escambia County’s water quality has been less than desirable at times. “TLDR” The water in Flint, Michigan is TOXIC. If you’ve kept up with the punk/rock and roll scene in the USA in the last 15 years, then I hope you’ve heard of the band known as The Swellers. The Swellers were a local band from Flint, Michigan. I had the privilege of becoming friends with Nick and Jonathan Diener of the band over the years – whether it was through playing shows, being on tour, or Nick recording my old band Young Lungs. A few weeks ago, I noticed Jonathan Diener (The Swellers, Baggage, Braided Veins) made a facebook post asking if any of his friends wanted to be featured on a compilation that would be sold for charity purposes. The compilation was going to be called “NOT SAFE TO DRINK”. I messaged him immediately and told him that Blight would be interested in donating some music if he wanted to have us on it. As long as I’ve been playing music, I’ve had a passion about bands standing up for something they believe in and having a positive message. With Blight being an instrumental band, we aren’t getting a message across lyrically, so we’ve got to push what we believe in through positive movements like this compilation. I knew going into this that we were going to be very tiny fish in a huge sea of other artists. As the weeks went by, more and more well known artists such as Taking Back Sunday, The Swellers, Craig Owens, King 810, Propaghandi, Anti-Flag, and We Came as Romans just to name a few, became a part of the compilation. I was just happy to contribute towards such a great cause; I didn’t realize how big the compilation was going to be! As momentum started building, coverage of the compilation was growing with articles published on Altpress.com, Substream.com, and other music websites. When all the entries were submitted, 77 artists are featured on this compilation. From local Michigan bands to National touring acts to a “strange” instrumental band from Pensacola, Fl. 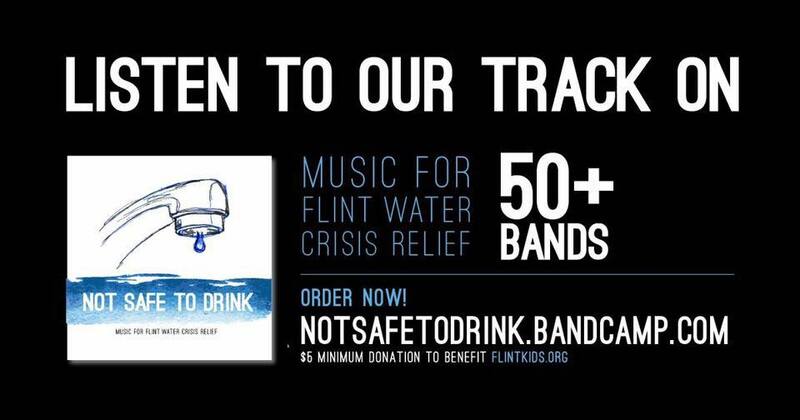 This album exists to bring awareness and relief to the people affected by the Flint Water Crisis. 100% of the proceeds from this release will go to FlintKids.org, a charity that focuses on the long term fixes and aid related to lead exposure in Flint, Michigan’s children. This entry was posted on February 26, 2016 by 850music in Posts.